Valdaj trucks are vehicles with Russian origin, determined for conditions, where GAZelle is not enough. GAZelle vehicles are limited by 3.5 ton total weight, which is the limit for driving license passenger vehicle category. If you are the owner of the GAZelle, and you needed to load it more then allowed, you sure know, how compliantly and willingly GAZelle let you do that. If you tried it several times, you probably also know the service costs, which your GAZelle repaid to you. For big cargo you need big car. And this is why Valdaj is here. Truck with total weight of 7,5 ton was made based on chassis of GAZ 3307, truck with total weight of 10 ton. Therefore Valdaj is heavily over dimensioned! The main difference between Valdaj and competitors is, that Valdaj do not share the chassis parts with 3.5 ton light versions, but it uses on the other hand components from tough Russian heavy truck! 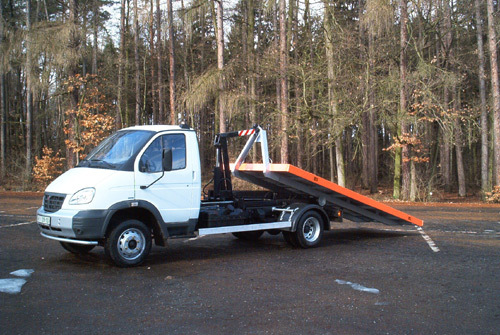 Brutal Russian chassis was equipped with modern Iveco F1C EURO5 engines, both 107 and 125 kW, Knorr Bremse ABS brake system, power steering by Czech company AXL Semily and more branded components. Valdaj is the ultimate answer for all of you, who cried for overdesigned truck, which offers not only huge superior running gear, but also the engine. Over 456 Nm of torque in 7.5 ton truck do not recognize any climb, superior brake system is scare of no downhill grade. Ultimate turning diameter, big roll angle and ultimate efficient of weight distribution of this Russian truck know no competitors!